Woodpecker's Hideaway is a new timber lodge with an open-plan living area and beautiful woodland views where you can often see woodpeckers at work. 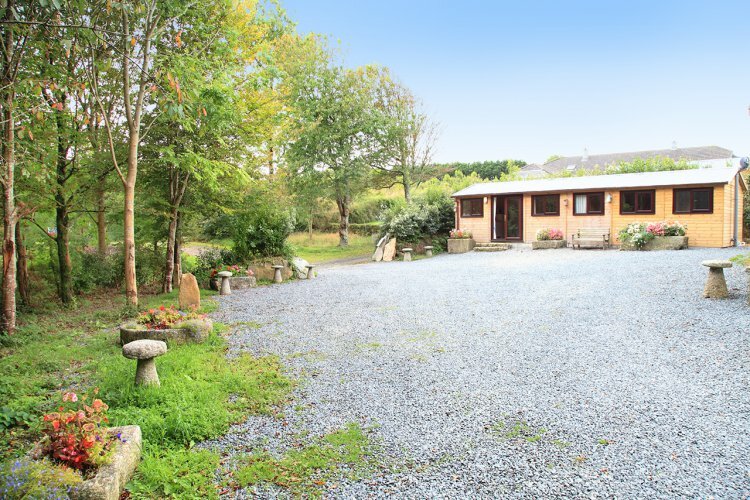 Situated about 400m up a woodland track near the village of Gweek, which has a shop and well regarded foody pub as well as creekside walks. Wild birds and animals are regular visitors to the nearby woods. Entered via the sliding doors into the living area. With comfortable seating provided by a two seat sofa and separate armchair, coffee table, LCD TV with DVD player and Sky TV, a dining table and two chairs. The kitchen area is well-equipped with an electric oven with 4-ring ceramic hob, fridge/freezer and a microwave. A washing machine and tumble dryer are provided in the adjacent garage. The bedroom has a 5' king-size bed with bedside tables and lamps, a wardrobe and chest of drawers. The en suite shower room has a large mixer shower, toilet, handbasin and heated towel rail. Outside, there is a large gravelled parking area. The property is next to the owners' home. Also on site, but not immediately adjacent, are three other letting properties: Pheasant's Retreat (370), The Cuckoos’ Nest (184) and Forresters Lodge (272). Rental includes bedlinen, towels, central heating, electricity, WiFi and Sky TV. Regret no smoking and no pets. Living/dining area with sofa, armchair, Sky TV & table with two chairs. Kitchen area with electric oven, 4-ring hob, fridge/freezer & microwave. Bedroom with king size bed, wardrobe & chest of drawers. En suite shower room with shower, toilet, handbasin & heated towel rail. Woodpecker&apos;s Hideaway is part of the Treverry Woods family of cottages, the other cottages are displayed below.